What could be easier? 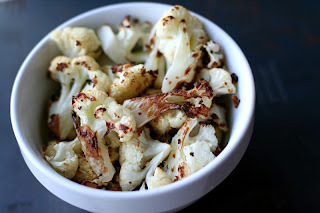 Cut up some cauliflower, toss it on a pan with a little oil and a little salt and stick it in the oven! This is one of my favorite vegetables! But, there is one thing I don’t like about cauliflower. It’s a mess to cut up when it's raw. Don’t you think so? 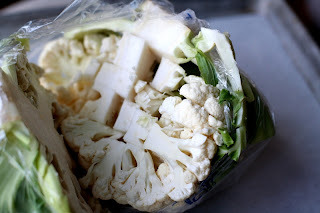 Well, I just stab my chef knife right through the center and then cut the cauliflower in the plastic wrapper! No mess, it’s all contained! This also helps to cut it in similar sized chunks which will make it cook evenly. Try it! Preheat the oven to 425°F. You need a rimmed baking sheet lined with parchment paper for an easier clean-up. 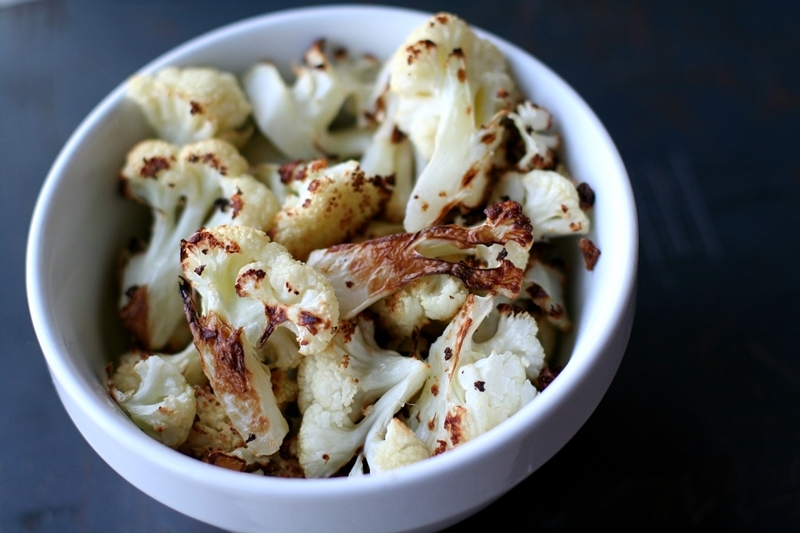 Arrange the cauliflower on the baking sheet and then drizzle about a Tablespoon or so of olive oil over them. Add a pinch of kosher salt and toss with your hands. Spread the cauliflower out in a single later and don't crowd them. If there are too many vegetables on the pan they will steam. We want a nice brown roast on them, not steaming! Ovens vary, so once you put them in the oven, start watching them at the 10-15 minute mark. There's a fine line between just done and burned, so use your timer.